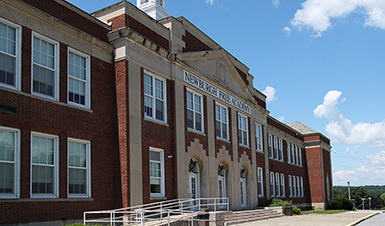 Newburgh Free Academy is a comprehensive high school offering several elective opportunities. In addition to a New York State Regents Diploma, many of these electives offer students opportunities to take New York State licensing exams. NFA Main and North campuses offer advanced placement and honor-level courses. Regardless of campus choice, all NFA students may participate in all interscholastic sports and club activities. Architectural/Engineering Design: Students learn residential and commercial structures along with cabinet making. In addition, students learn advanced computer software in CAD programming for architectural design and electronics. Many of these courses collaborate with our NFA Solar Car project. Automotive: Within this sequencing, students will have an opportunity to learn auto body, auto repair and auto mechanics. Barbering: Is a two year course that will teach the required mastery levels of barbering. Students will complete hands-on work as well as a documented apprenticeship. This will prepare them to take the state barbering certification exam. Ceramics: Students learn the art, process and history of ceramics through hand building and use of a potter’s wheel. Cosmetology: This course of study teaches students the science and skills for hair, nail and skin care, which prepares students for the N.Y.S. Cosmetology License. Culinary Arts: This program emphasizes the art of cooking and food preparation. Students advance to food presentation and aspects of working in a professional kitchen atmosphere. Fashion: Students learn sewing, drawing/design and textile design. These courses prepare students for the fashion world. Lifetime Wellness and Fitness: Offers students an opportunity to explore the fields of sports, recreation, and personal health and wellness. Performing Arts: Offers the opportunity to explore careers associated with the performance industry such as; dance, stage craft lighting, music (Chaminade, Accapela, Madrigals), sound board and performance techniques and drama. Visual Arts: Offers courses in communications, graphic design, digital media, photography, illustration and full sequencing in pottery and art portfolio courses. Welding: Offers students an opportunity to explore one of the fastest growing career industries. Students have an opportunity to take the New York State DOT welding test. AFJROTC: Developing citizens of character dedicated to serving their nation and community through Aerospace Education, leadership management and community involvement. Available at Main and North Campuses. Criminal Justice: Students learn law, forensics and criminal procedures, while being exposed to re-enacted crime scene detective investigative labs. Students have the opportunity to obtain a N.Y.S. Certified Security Guard License. Health Related Services: Provides an exploration into the health services field. These courses expose students to the various health-related careers in the medical field, including Physical Therapy and Nursing. Students can choose a pathway in the Nursing program, one which leads to certification as a CNA (Certified Nursing Assistant), the other leading to LPN (Licensed Practical Nurse). Excelsior Academy is a new model for teaching and learning that brings together high school, college, and the world of work in order to prepare students for the complex and ever-changing global workforce in information technology. Students in the Excelsior Academy graduate with an Associates in Applied Science degree from SUNY Orange, in addition to their high school diplomas. They also obtain the skills and knowledge they need to continue their studies or step seamlessly into well-paying, high-potential jobs in the Computer Information Technology industry. Excelsior Academy’s curriculum will offer project based learning experiences and real-world applications of science, technology engineering, and math. Students will develop important academic and career skills as they learn through projects developed in collaboration with IBM. Due to the accelerated pace of learning in Excelsior Academy, the length of the school day and the school year is longer for enrolled students. NFA West seeks to cultivate student self-esteem by offering a non-traditional, educational experience. 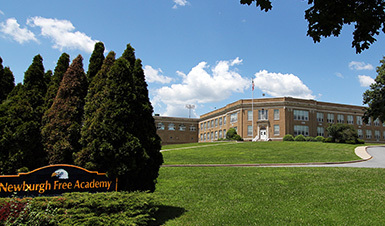 NFA West Campus is a school of choice. Honoring student choice paves the way for students to take charge of their education. The Goal of this campus is to provide positive learning experiences that are flexible and personalized. Not all students are successful in a traditional environment. We strive to provide opportunities for academic success through non-traditional approaches to learning in a supportive environment. NFA West is a Big Picture Learning (BPL) school that strives to be a place where students are known well, understood, respected and able to have genuine relationships with adults. Each scholar's educational program involves authentic experiences with real world standards and consequences, and is designed by the people who know the student best. Students’ learning plans grow out of their individual needs, interests, and passions. Our graduates are unique and creative individuals who will be able to rise above adversity in the adult world. One student at a time, NFA West provides a personalized learning environment that allows students to gain the skills and knowledge necessary to achieve success beyond high school. 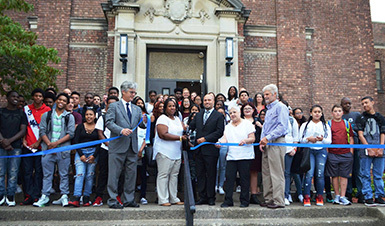 NFA West relies on strong relationships with family, community, businesses, government and all other educational institutions to expand the role of the school in the community and the community in the school. NFA West students are required to participate in an internship opportunity one day a week that allows for them to build knowledge, understanding and skills in the context of authentic work. Each student learns through pursuing his or her own interests and passions. Students are partnered with a Business mentor who will guide them through discovering their college and career interests. NFA West Advisories are designed to foster stronger adult-student relationships and a stronger sense of belonging and community among students. Teachers meet with small groups of students for the purpose of advising them on academic, social, or future-planning issues. Each advisory group meets every day. NFA WEST students create a learning plan that allows for them to set goals and reflect on how all of their course subjects relate to their respective career interest. Students will demonstrate all facets of the learning plan through an exhibition that are presented to parents, students, advisors and mentors.